Dogecoin, a cryptocurrency with the legendary Shiba, a dog made famous in the Doge meme that was popular in 2013 was originally released as a joke poking fun. Over its existence, it not only has surprised by its growth and capitalization but also by acting as a sponsor of Jamaica’s bobsled team at the Winter Olympics in Sochi or, a NASCAR racer. What next can one expect from the crypto? In 2013, Bitcoin had already been a global phenomenon followed by the boom of various alternative currencies or cryptocurrencies. Like many other things on the internet, it also became an easy target for jokes. A former IBM programmer, Bill Markus with an Adobe Systems marketing specialist, Jackson Palmer wanted to spice up the cryptocurrency business by adding some fun and launched Dogecoin with the iconic Japanese dog of the Dodge internet meme. 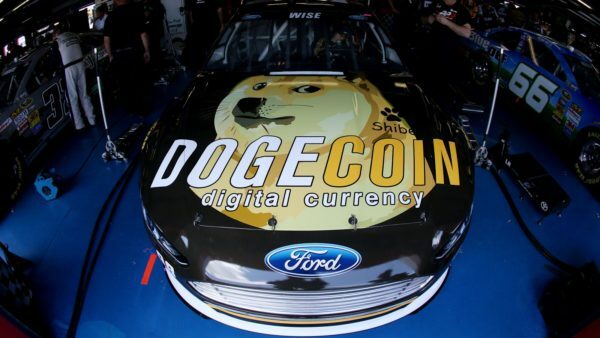 A few months after launching the surrealistic crypto, a NASCAR racer Josh Wisesits is driving at tremendous speed a 98 Moonrocket, a high-performance racing car with a huge Shiba Inu on the bonnet and words “Dogecoin digital currency”. The community around this crypto had raised within 10 days USD 55 000. At that time it was clear that Dogecoin was not going to be something far more valuable than a joyride. 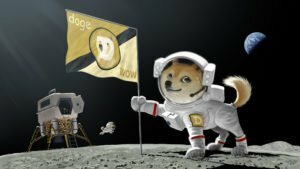 “To the Moon, Dogecoin!” ranks among the most famous slang expressions shouted by crypto-fans (perhaps one of the ten top in the crypto world, next to “HODL and “Lambo”). The first association was with Dogecoin. Not surprisingly, on 19 December 2013 (14 days from its launch), the value of dogecoin rose by 300% from USD 0.00026 to USD 0.00095. In January, five months before Josh Wise put his foot on gas of his dogecoin car, the volume of transactions in the dogecoin network exceeded the volume of the bitcoin network! Something unseen before in the world of cryptocurrencies. By January 2018, Dogecoin’s value had risen by 1700 % reaching its high at USD 0.0193 while the market capitalization reached incredible USD 2.12 billion. Following its mission, dogecoin was sky-rocketing to “the Moon”. After being affected by the decline at the turn of the year, dogecoin’s current price has stabilized at USD 0.0063 (of 22 February 2018) and is estimated to grow throughout the year up to USD 0.025 to USD 0.050. Dogecoin is based on Litecoin technology. It’s a decentralized peer-to-peer currency using a blockchain BUT capable of processing transactions twice as fast as Litecoin. To confirm a block with dogecoin only takes one minute (compared with 2.5 minutes with Litecoin and 10 minutes with bitcoin). 100 billion coins were created and because the process of creating dogecoins is simpler, the last dogecoin should be mined much sooner than the last bitcoin. The complexity of creating a coin differs every 4 hours and miners receive rewards in random ranges. Anyway, what else could one expect from a currency that was originally meant to be a joke? Speaking of forks, a well-known phenomenon among cryptocurrencies, this autumn dogecoin is facing its first hard fork built on Ethereum technology. The process started with a test on 5 February (using TrueBit technology) to make sure that Doge could exist separately after migrated to the Ethereum network and then returned to its original network. The process is known in the community as the Dogethereum bridge. The main source of inspiration and power for Dogecoin is its community. Many other cryptos might envy them this support. Memes roll like an avalanche across the internet. People love having fun. It would only be good if fun could make such a complex issue as cryptocurrencies easier to absorb. The community has demonstrated its power and sense of humor by organizing the NASCAR event and by sponsoring Jamaica’s bobsled team at the Winter Olympics in Sochi in 2014. That the event was not only about having a good time was proven in the fundraising for building a well in Kenya winning dogecoin some prestige among other cryptocurrencies and helping third-world countries around the world. The combination of charity with innovative technologies able to compete with Bitcoin and Litecoin makes dogecoin a cryptocurrency with a potential that may surprise us in the future.